Shopping for World of Warcraft Coins? Collectible coins feature fan-favorite characters from WoW! Now is the time to hold and hoard solid precious metal coins from the game. Includes 3 coins in a handsome display case. Ready for display on a desktop or wall! Whether looting dead mobs or completing a quest, now is the time to hold and hoard solid precious metal coins from the game in your hand! 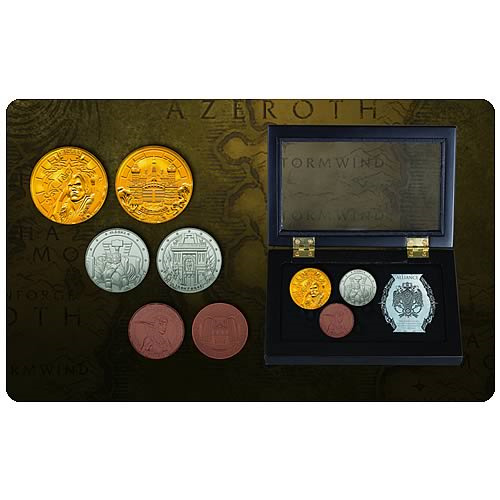 All three coins included in this special World of Warcraft Collectible Set are plated in precious metals, and each coin features a Major Alliance Leader on one side and the leader's corresponding city on the opposite side. All coins are about 1/8-inch thick and are removable from the box. A non-removable commemorative metal plaque with the Alliance emblem is also included. Ready to be displayed on a desktop or wall, the set is presented in a hinged, black wooden box with a glass window and a flocked, vacu-formed tray. The box measures approximately 3 1/4-inches tall x 6 1/4-inches wide x 3/4-inches deep. The product is packed in a protective self-shipper. Wow is right! Limited edition of 1,000 pieces. The 24-karat gold-plated coin features the Human Military Leader of the Alliance, King Varian Wrynn of Stormwind, and measures approximately 1 5/8-inches in diameter. The sterling silver-plated coin showcases the Dwarven King, Magni Bronzebeard of Iron Forge. It measures about 1 3/8-inches in diameter. The copper-plated coin measures approximately 1 1/4-inches in diameter and spotlights the Night Elf High Priestess, Tyrande Whisperwind of Silvermoon.